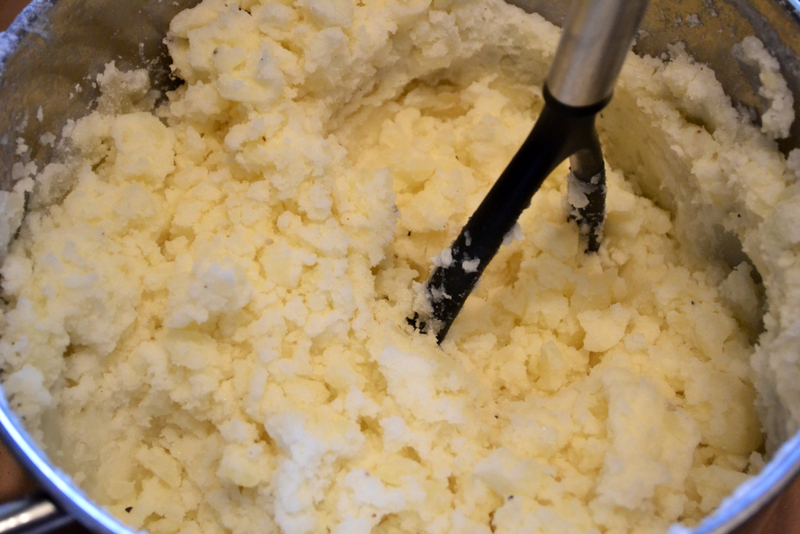 Please welcome my guest blogger, Will and his recipe for Garlic Mashed Potatoes . . . big batch style! What do you get when you cross russet potatoes priced at 10lbs for a $1 with a Midwestern boy? 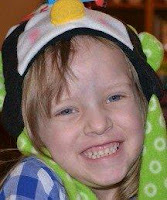 You get 17 packages of mashed potatoes in the freezer, two loaves of potato bread (Jul’s recipe in future blog), one bowl of potato salad, plenty of peelings for the chickens and one big smile! Jul and I picked up a couple bags of potatoes with the goal of spending a couple hours turning them into future meals. 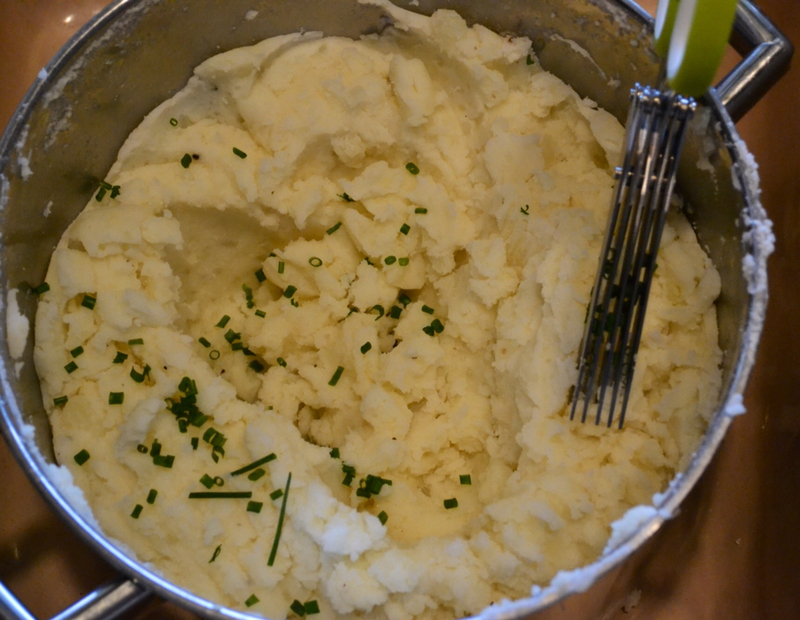 While Jul puts together exceptional meals, superb desserts and marvelous pastries, I have perfected Garlic Mashed Potatoes! Everyone brings skills into their marriage. I brought the ability to peel potatoes in record time. While in early high school and just before meeting Jul, I had a job at Morris’ Restaurant in downtown Mason, Michigan. It wasn’t a fancy place, but Mr. Morris made great tasting food. Every day after school, Jimmy King and I would show up for our evening shifts. The first order of business was to peel potatoes. After shaving the outside off tons of potatoes (it seemed like it anyway), I became very proficient at the task. No nicks, no blood, just well cleaned spuds. 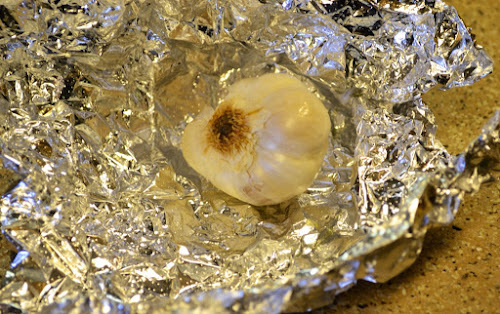 Drizzle garlic with olive oil; wrap in foil and bake at 350F for 12-15 minutes, until you can smell the garlic. Peel and cut potatoes in half or thirds so all the pieces are similar size. 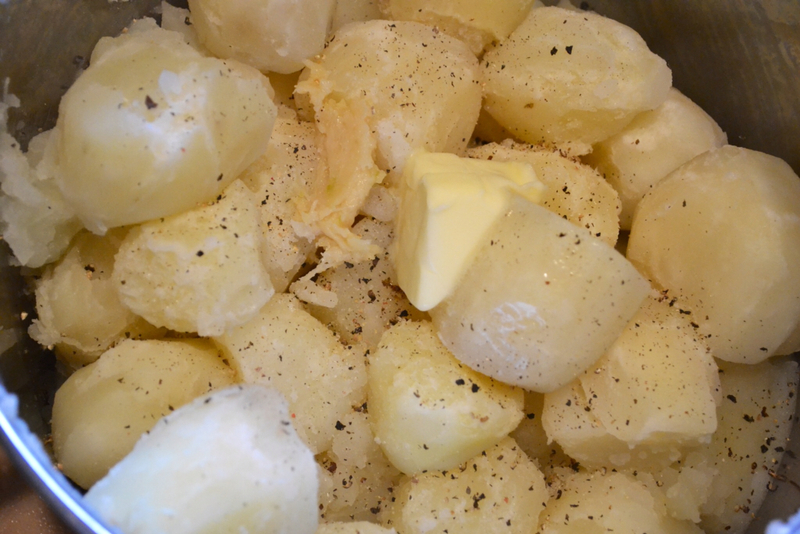 Add peeled and cut potatoes to Dutch oven/large pot. Cover potatoes with cool water and 1 tablespoon of sea salt. 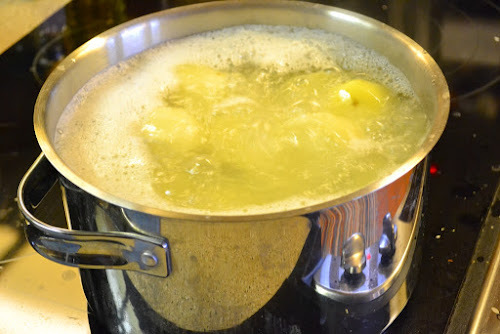 Cook potatoes on HIGH heat; begin timing for 18 minutes when water begins to boil. Potatoes are done when you can easily pierce with a fork. Save 1 1/2 cups of the potato water and 1 cup of potatoes for future bread making. Drain potatoes; place pot back on turned off, but still hot burner to evaporate excess water for 30 seconds. Set potatoes aside. Cut head of garlic in two and squeeze roasted garlic onto a cutting board. 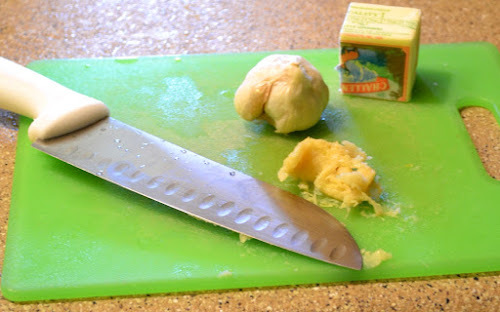 Cream garlic using the side of a large knife. With cooked potatoes still in pot, add butter, salt, pepper, to taste, chopped chives, and garlic. 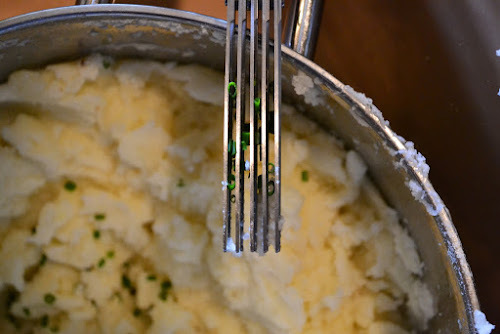 Mash well with potato masher (Jul's secret to success for rich, creamy potatoes . . . Do not add milk until AFTER potatoes have been thoroughly mashed. Add milk and do a short final stash (stir--mash). FREEZER INSTRUCTIONS - The potatoes are now ready to eat or freeze. Use quart-size Ziplock freezer bags. Fill freezer bags with enough mashed potatoes for a family meal. Flatten out so the bag is full and the air is out. Freeze on a cookie sheet so they remain flat for storage. Thaw and heat in oven or microwave. Add a fresh pat of butter, salt and pepper, and a touch more milk if needed. Drizzle head of garlic with olive oil; wrap and bake in 350F oven. Mash garlic with the side of a heavy knife. Set timer for 18 minutes when water begins to boil. Drain water from potatoes; add butter, salt and pepper. Mash thoroughly before adding milk. Add milk; Stash (stir/mash) potatoes. NOTE FROM JULIE: I can't begin to tell you what a God-send it is to have a husband who's not only capable, but also willing to do up a mess of Garlic Mashed Potatoes for our freezer! This is our answer to healthier, "instant" mashed potatoes or the pricey 'Simply Potatoes' you find in the grocery store. Will ended up peeling 20 pounds of potatoes . . . That means 17 freezer bags (meals) of Garlic Mashed Potatoes, enough potatoes for a big bowl of Homemade Potato Salad, potato water and potatoes for potato bread! Think of all the time and money we saved with 2 bags of potatoes costing us $2.00 (on sale at Bashas' this week). And think of all the mess and dishes we avoided doing over and over again because we 'big batched' it! We are all about eating well, saving time and money . . . Over at Julie's!! !